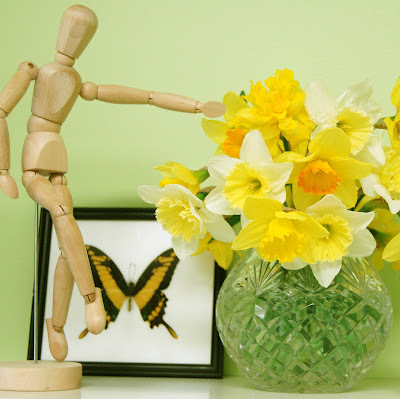 Show + Tell: THE DAFFODILS ARE COMING! 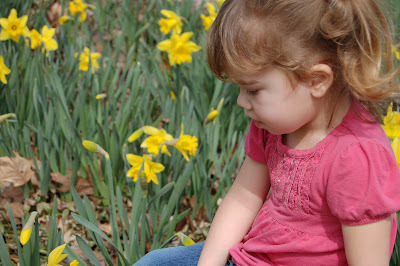 Here's Mia checking out the daffodils peaking up from the leaves a couple days ago. Now today there are even more blooming. So I thought I'd treat Woodrow, my office buddy, to a fresh bouquet. He gets Spring Deficit Disorder too. He's so happy he's dancing on the table (you should see him at the office party; gets a little crazy).